Turkish Presidential spokesman İbrahim Kalın on Wednesday slammed a German court decision for National Socialist Underground (NSU) member Beate Zschaepe. “This decision is far from satisfactory. Furthermore, the victims' families were persecuted during the initial stages of the investigation with prejudiced and unfounded charges. This situation has also offended the Turkish community in Germany. 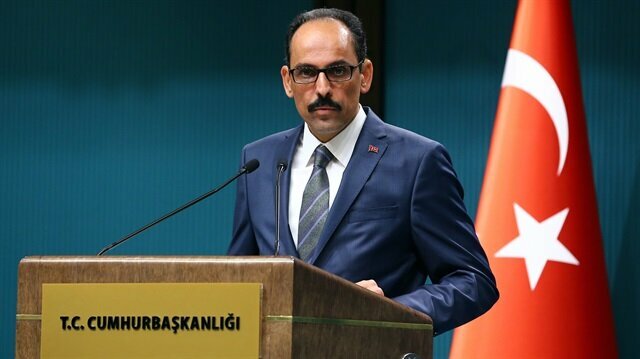 We hope that racist and xenophobic homicides like the NSU murders in Germany do not happen again,” Kalın said. The neo-Nazi National Socialist Underground (NSU) killed eight Turkish immigrants, a Greek citizen, and a German policewoman between 2000 and 2007, but the murders remained long unsolved. The group also carried out bomb attacks targeting shops owned by immigrants in Cologne. Turkey on Wednesday said a German court's verdict on the neo-Nazi NSU murders had failed to reveal the full dimensions of the case, including "the affiliation of the deep state and intelligence. "German neo-Nazi murderer sentenced to life in prison"Unfortunately the verdict given today did not reveal the background of the NSU murders, and the full scope of dimensions in the affiliation between the deep state and intelligence went unrevealed, as the real criminals remain in the dark," said a Foreign Ministry statement. "Thus, the verdict is unsatisfying in the interests of justice and lacking in relieving the public conscience," it added.Munich's Higher Regional Court sentenced neo-Nazi Beate Zschaepe to life in prison over membership in the NSU terrorist group and complicity in the murders of 10 people and two bomb attacks.The neo-Nazi National Socialist Underground (NSU) killed eight Turkish immigrants, a Greek citizen, and a German policewoman between 2000 and 2007, but the murders remained long unsolved. The group also carried out bomb attacks targeting shops owned by immigrants in Cologne. “Such cases are a test of sincerity for all of Europe, and especially Germany. Unfortunately, Germany did not pass the sincerity test as it failed to show strong resistance to racism in the case of the NSU. We will continue to closely monitor the situation. We expect German authorities to uncompromisingly fight the increasing racism in Germany and Europe, and politicians and the media to act with common sense,” he added. Munich's Higher Regional Court on Wednesday sentenced neo-Nazi Beate Zschaepe to life in prison over membership in the NSU terrorist group and complicity in the murders of 10 people and two bomb attacks. The scandal surrounding the neo-Nazi NSU has led to criticism of police and security agencies, and accusations of institutional racism. While recent revelations have shown that Germany’s domestic intelligence agency had dozens of informants who had contacts with the NSU suspects, officials insisted that they had no prior information about the NSU terror cell and its suspected role in the killings. A German court sentenced neo-Nazi Beate Zschaepe to life in prison Wednesday for the terrorist group NSU’s murders and bomb attacks targeting Turkish immigrants.At Munich’s Higher Regional Court, Presiding Judge Manfred Goetzl said Zschaepe was guilty of membership in a terrorist group and complicity in 10 murders and two bomb attacks committed by the neo-Nazi group.Goetzl ruled out any parole before she serves 15 years -- the average life term in Germany -- stressing the “exceptional severity of the crimes” she committed.Turkey criticizes German court's NSU verdictA parole court will decide after this period whether Zschaepe is eligible to apply for release.In similar terrorism cases, German parole courts extended prison sentences to up to 26 years.Shadowy group NSUThe National Socialist Underground (NSU) killed eight Turkish immigrants, a Greek citizen, and a German policewoman between 2000 and 2007, but the murders remained long unsolved. The group also carried out bomb attacks targeting shops owned by immigrants in Cologne.During the five-year trial, Zschaepe denied any role in the killings and bomb attacks and tried to lay the blame on her two late colleagues in the far-right terror cell.But her defense team failed to present any strong evidence to dispute the accusations.The NSU was only revealed in 2011, when two members -- Uwe Mundlos and Uwe Bohnhardt -- died after an unsuccessful bank robbery and police found guns and extreme-right literature in their apartment.Zschaepe, the group’s last surviving member, has provided no new information about the NSU, and major questions over the murders remain unanswered.Institutonal racism allegedThe scandal surrounding the neo-Nazi NSU has led to accusations of institutional racism in Germany.Until 2011, Germany’s police and intelligence services ruled out any racial motive for the murders and instead treated immigrant families as suspects, questioning them over alleged connections with mafia groups and drug traffickers.While recent revelations have shown that Germany’s domestic intelligence agency had dozens of informants who had contacts with the NSU suspects, officials insisted that they had no prior information about the NSU terror cell and its suspected role in the killings.